The Indian Kurti is an extremely versatile piece of attire that has managed to win the hearts and minds of the global masses. Although it is a traditional garment the Kurti is considered to be extremely trendy and can be worn in many different ways. This versatile garment is the ideal all year round top that can be worn by men and women alike. 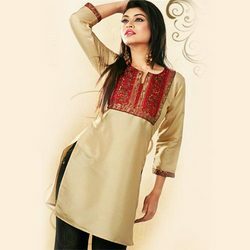 Of course they vary in terms of their design and cuts but generally you will find both genders to be quite comfortable with sporting the Indian Kurti. The classic Indian Kurti offers a quick fix solution. You will be able to find Indian Kurtis made using a variety of materials such as polyester georgette, viscose, georgette and crepe blends amongst others. These kinds of kurtis are excellent for the rainy season. You will find designers to be experimenting with colors. Generally dark colors are preferred for rainy seasons whereas lighter colors are reserved for the summers. What makes the Indian Kurti different? You will be able to find a considerable amount of variance with regards to the design of the kurti. One of the things that differentiates the Kurti from the traditional Kurta is its length. The standard length of the Indian Kurti varies from the mid thigh to just above the knee. This is what makes it possible to sport the Indian Kurti with a pair of jeans or khakis. Similarly you can adjust the fitting and style of these kurtis to suit your preference. Styling varies from loose fit to semi fit and tight fit. Kurtis generally have slits on both sides. However the slits are never longer than 1 foot. You also have the option to choose the kind of sleeves that you want for your Kurti. Sleeveless, short sleeves, cap sleeves and three quarter sleeves, everything goes with the Indian Kurti. What To Wear The Indian Kurti With? This versatile garment can be worn with a number of different combinations. The traditional shalwar is a great option if you are looking for more fabric volume. Another popular option is to go for churidar pajamas. The most commonly used materials for churidar bottoms is polyester and Lycra blends as they provide the optimum fitting and are easy to take care of. Slim fit pants are another great choice and you can even go with caprice to create a new unique style. Many Indian women like to sport a long draping cloth known as the dupatta along with their Kurti-based outfit. Scarves and stoles will work just as well. There is plenty of variety when it comes to the prints for Indian Kurtis. Floral prints seem to be extremely popular with the women. However simple kurtis have their own elegant charm. Geometric concepts can also be seen featured on Indian kurti prints. The more decorative Indian kurti patterns are adorned with intricate embroidery and sequence work on fancy necklines. Different techniques such as cross stitch, block printing, beadwork and kantha work are often used to create unique patterns and prints for Indian Kurtis.